Throughout his career, Woody Guthrie dabbled in numerous musical styles, both in terms of lyrics and arrangements. Yet most of his best work saw him sing about the causes he kept close to his heart — the Allies, the unions, the poor dust bowl farmers and any other group oppressed by society. The third in an anthology released by Smithsonian Folkways, Hard Travelin’, focuses on Guthrie’s repertoire of topical songs. Recorded more than half a century ago, the songs still hold up and, more importantly, represent Guthrie at his most passionate and creative. 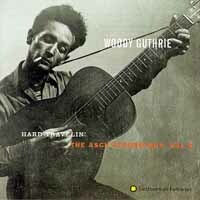 “Hard Travelin’,” one of Guthrie’s most enduring songs, opens the album. The tale of a man working his hands to the bone “trying to make about a dollar a day” was the perfect ballad for farmers scraping to get by after losing their crops in the great dust storms. And it epitomizes the everyman ballads that Guthrie pioneered. “Sally Don’t You Grieve,” “When the Yanks Go Marching In” and “Talking Sailor” also take up the Allied cause. The best song of this group is the anti isolationist “What Are We Waiting On?” Guthrie urges action — “when I think of the ships and the men going down while the Russians fight on across the Don / there’s London in ruins and Paris in chains / good people, what are we waitin’ on?” — while explaining that a unified worldwide force will be “the union that’ll tear ol’ Hitler down.” The album also includes some great nuggets that don’t fall under the aforementioned topics. “Two Good Men” is about Sacco and Vanzetti, two immigrants executed after a controversial trial, where Guthrie says the judges and lawyers had “done more tricks than circus clowns.” He sounds great on children’s songs “Ship In The Sky” and “Hanukkah Dance.” He wrote “Hanukkah Dance” for his own children, who were raised in the Jewish faith of their mother. His interest in Judaism also led to “The Many And The Few,” a lyrical retelling of Jewish history that includes the return from Babylon up to the Hanukkah legend. Folkways put a great compilation together with the four-part Guthrie rereleases, and Hard Travelin‘ is arguably the best of the group. There are a number of great political songs not included in the collection at all (“Deportee,” “Jolly Banker,” “Dear Mrs. Roosevelt”), but they either were not recorded during the sessions with Moses Asch or the tracks did not reproduce well. Not long after Guthrie recorded most of these songs, Hitler was defeated, labor laws were strengthened and the great dust storms subsided. But his lyrics perfectly capture the turmoil of Depression-era American life, making them as fresh now as when he penned them. Hard Travelin’ is an impeccable time capsule, and one with several lessons for today’s listeners.